On this webpage, I’ll make a FAQ on common eBS problems and troubleshooting. Probably the format will change over time. But I’ll just start. I use basic flow diagrams, to give an overview of the process. Under the diagrams is an explanation of all the steps. 1) Check if the Internal Manager is running. On Unix, you can run: ps –ef | grep ‘FNDLIBR FND CPMGR’. If this returns a process, check the start time for the process to make sure it is the correct process. 2) If a process is returned, and it started at the time you started the managers, the ICM is running. 3) The ICM is not running. First check the adcmctl.txt file. It is found in the process_log directory. (Check your autoconfig xml file or the adcmctl.sh script). It will show the logs for the start-up scripts of the ICM. 5) If no process is returned, start the apps listener with adalnctl.sh. Wait a minute afterwards, for the ICM to retry starting the managers. 6) The ICM is running, or was started successfully before it died. 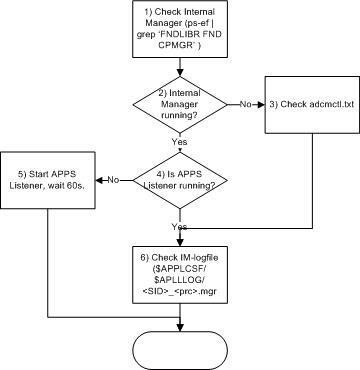 Check the logfile from the ICM in $APPLCSF/$APPLLOG. By default the file is named <SID>_<proc>.mgr, where proc is the process_id from adcmctl.txt. 1) Look for the notification in ‘wf_notifications’. Check the status, mail_status, recipient_role and notification_id. 2) If Mail_status = ‘SENT’, the message has been mailed already. If status<>’OPEN’ (Note the difference between status and mail_status), the notification is not eligible to be mailed anymore. 3) The Notification Mailer has already sent this message. Maybe it was sent to the TEST_ADDRESS from the Notification Mailer. 4) Check the mail_preference for the recipient_role from wf_roles. 5) If the preference is ‘QUERY’, ‘SUMHTML’, ‘SUMMARY’ or ‘DISABLED’ then the recipient will not receive notifications by mail. 6) Change the preference in the Users preferences. Or test with a different user. 8) If you received a result on the query, the notification is in the queue. 10) The status of the message should be ‘READY’. The ‘ENQUEUE_ENABLED’ and ‘DEQUEUE_ENABLED’ columns should be ‘YES’. 11) Reprocess the message with the conc. Request. Or stop/start the queue with dbms_aqadm. 12) Check the Notification Mailer logfile. The notification is ready for the mailer, but it is unable to pick it up. Check if the mailer shut down due to too many errors. 15) Unfortunately, your notification seems to have gone missing. Consult Oracle Support. Please inform us of the solution in this case, so we can extend the FAQ. 16) The notification is still in the deferred queue, waiting to be picked up by the ‘Workflow Deferred Notification Agent Listener’. Check the status of this listener. And if needed, check its logfile. 19) Check if the Business Event ‘oracle.apps.wf.notification.denormalize’ is enabled and has a subscription to procedure ‘Wf_Notification_Util.Denormalize_RF’. 20) If either the Business event is disabled, or the subscription non-existent or disabled, go to 21. 21) Make sure that the Business event is enabled and the subscription is valid and enabled. You will still have to reprocess the notification with the concurrent program to resubmit notifications. 22) Unfortunately, we can’t locate the issue yet. If you manage to solve the issue please inform us, so we can update this FAQ. This entry was posted in eBS, Oracle, Troubleshooting, Workflow and tagged concurrent, fix ebs, mailer, notification, notification_mailer, Oracle, query, script, Troubleshooting, wf_notification_out, Workflow on April 1, 2010 by Arian Stijf. After a long silence, it’s time to write another blog entry. I received a request to write about Oracle Reports. And I think that will be a new series (Even though I didn’t finish the workflow series yet). But the last few days, I’ve been working on cleaning up workflow tables. Most of these tables are very straightforward and you can find queries and descriptions in the workflow series. However, there are some more complex cases. There are the advanced queuing (aq) tables. And also some data hidden in wf_item_attribute_values for items started by the Business Event System (BES) (reminder to self: Write that article about BES too). In the aq-tables, the payload of the message (i.e. the data transferred by the message) is stored in a custom type. The same goes for the event_data in wf_item_attribute_values. In this article we’ll see how we can get the data from those ‘strange’ columns. The problem that many ebs-dba’s are facing is how to select the data inside this column. In this case, it would be the task_id that we are interested in. Oracle delivers several API's for use in PL/SQL. But sometimes you want plain SQL. One way to do it is to use a clever substr/instr construction or a regular expression. But the efficient way to do it, is to tell Oracle which info you want. Let’s take a look at the custom type. As mentioned, it is WF_EVENT_T. We can find the description in the DBA_TYPES table. This tells us that the WF_EVENT_T is an object type. Ok. We now know the whole structure of the parameter list. Back to the Varray. A Varray (Varying Array) is of course an array structure. Since this is similar to a table structure, you can cast the Varray into a table. Then you use the casted table to select your data. Let’s do that to get the names from the parameter list. Now that’s a neat trick. We can join our table to its own column! In our case, we only have a task_id parameter. We could do the same again, to get the value of the parameter from the value column. That can kind of hurt if it,were it not for the NL with a COUNT STOPKEY (Because of the rownum=1). The reason for the expensive plan, is because for every row from wf_item_attribute_values, Oracle needs to get the data from event_value. It basically does a carthesian join with itself. Now we use a scalar subquery, where Oracle will access only the event_value for the rows that will be returned to the user. You can see this in the explain plan by the collection iterator picklefetch (= the operation that collects the data from a collection type) being pushed up to just before the select. Still expensive. But much better. So that will let us peek into the event_value column on wf_item_attribute values. Be aware that different processes will enter different parameters into the event_value column. But with the information above you should be able to understand how to select the data and use it in your own queries. Now let’s take a look at the AQ-tables? As I mentioned, they carry their payloads in custom types too. One that most ebs-dba’s will have seen is WF_NOTIFICATION_OUT. When the workflow engine generates a notification, it will be stored in ‘WF_NOTIFICATIONS’. However, a message will be posted on ‘WF_NOTIFICATION_OUT’ too. This message will be read by the workflow notification mailer, which will use it to get the relevant data from WF_NOTIFICATIONS. If you haven’t run the notification mailer for a long time, you might want to clean up WF_NOTIFICATION_OUT a bit. There is a script available from Metalink to do the job. (There is also a quicker but unsupported way). But you might want to see the records in WF_NOTIFICATION_OUT related to WF_NOTIFICATIONS to decide if a cleanup is appropriate. The regular AQ-information is there. And our payload in USER_DATA. This time it’s an AQ-type. So let’s see what properties we have. I just query the whole contents of properties for the first row in wf_notification_out (This particular system doesn’t have a WF-mailer running. If it is running, chances are that you won’t have any records in WF_NOTIFICATION_OUT). That concludes this article. Based on the above, you will be able to select the data you want. This entry was posted in eBS, Oracle, Scripts, Workflow and tagged collection, object, Oracle, payload, query, script, sql, type, user_data, wf_notification_out, Workflow on February 14, 2010 by Arian Stijf.